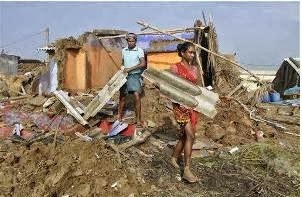 Hit hardest by Cyclone 'Phailin', the coastal district of Ganjam is estimated to have suffered a loss of at least Rs 3,000 crore in the nature's fury which has deprived lakhs of people of their livelihood and damaged 2.4 lakh houses. Fishermen have suffered massive losses as their nets, boats and catamarans have been damaged. The farming community has also been hit with the standing paddy crop submerged in water.